A discussion on recent changes to Australia’s detention industry and policy by Sanmati Verma and Angela Mitropoulos. Sanmati Verma: At present, Australia is in the process of experimenting with different forms and manifestation of immigration detention for asylum seekers who arrived by boat. In this process, the model of ‘closed detention’ has given way to various punitive and restrictive arrangements that nonetheless replicate the cages and parameters around asylum seekers in the community. On 5 October, the Australian and Nauruan governments jointly announced that the ‘Regional Processing Centre’ on Nauru, would be ‘opened’ to allow asylum seekers freedom of movement throughout the country. 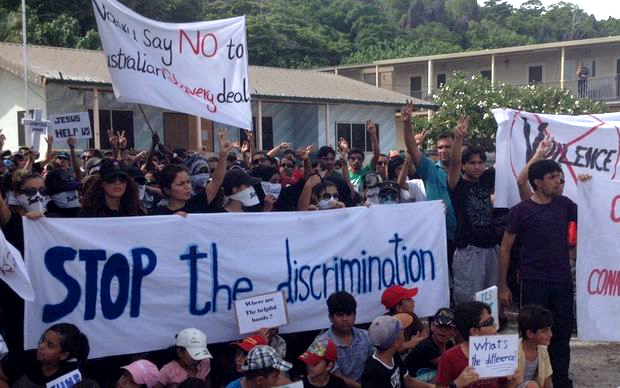 The Nauruan government subsequently promised to decide all remaining asylum applications within the week – although has now gone back on that promise. The move to ‘open’ the facilities on Nauru was heralded as a hard-won achievement, and argued by the Minister to defeat any remaining questions about the constitutionality of Australia’s rendition of asylum seekers to Nauru. Although the arrangements those asylum seekers now face on the tiny, 21 square kilometre island state are no less punitive or restrictive than what came before. ‘Open centre’ arrangements have in fact been in place at Nauru RPC since 25 February 2015, when asylum seekers were permitted leave (upon application) from 9:00am to 5:00pm three days per week. Around the same time, the Nauruan government also released some 400 people into the community from the centre, after they were found to be refugees. In March 2015, 300 of the 400 asylum seekers then resettled in the community staged a mass protest in front of the offices of Connect Settlement Services – a consortium of welfare agencies contracted by the Australian government to provide settlement and education assistance to asylum seekers. 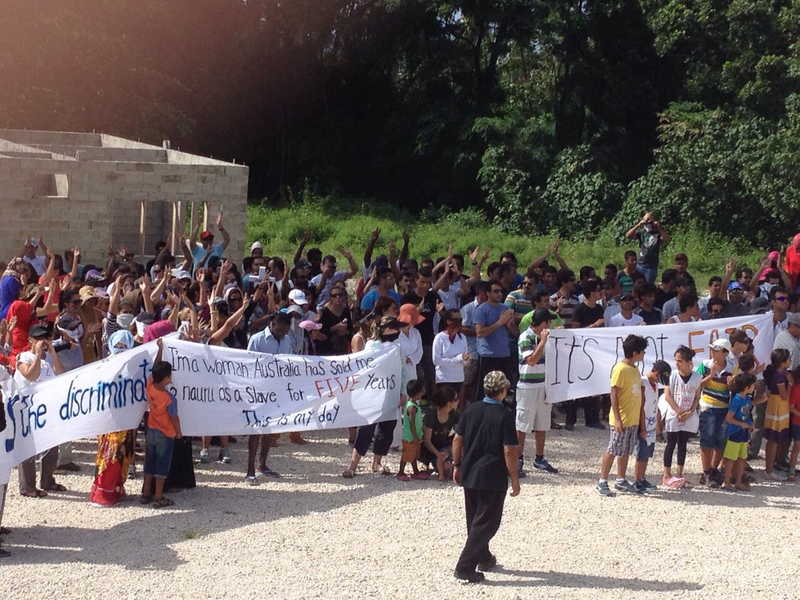 The mass protest involved asylum seekers quitting jobs that had been arranged for them by Connect Settlement Services, and children quitting school in protest. From the time that refugees began to be resettled on Nauru, reports of violence (including sexual violence) have multiplied. The ‘resettlement’ offered on Nauru involves a temporary residence permit of up to five years, with access to ‘settlement services’ and permission to work, subject to an unclear restriction on accessing a business permit from the Nauruan government. It is entirely unclear whether the ‘Temporary Settlement Visa’ allows for travel into our out of the country. It certainly does not allow asylum seekers to be reunited with their family. It also does not guarantee a pathway to permanent protection; either in Nauru or Australia. It is a license for an indefinite period of purgatory on the remote island state. ‘Deterrence’ as an orienting policy principle arises from the August 2012 report of the Expert Panel on Asylum Seekers, convened by the previous Labor government. It is a morbid inversion of the individualising logic of asylum. The regime established by the UN Convention on the Status of Refugees invites individuals from the global south to approach societies in the north as supplicants, speaking of their individual plight and suffering – but never of colonisation, environmental degradation, war, Empire. Asylum regimes globally require asylum seekers to narrate their pain in a particular, stripped-bare language. ‘Deterrence’ involves amplifying individual pain and risk, in order to dare asylum seekers to return to their countries of origin. Angela Mitropoulos: Follow the money. Efforts to transform the detention system—so as to save rather than abolish it—are driven by two, critical factors. The first, and most significant factor, is that while the detention industry has channelled billions of dollars—around $10 billion in the last three years—to companies such as Serco and Transfield, the actual profit margins are so slim they verge on disappearing. The enormous financial costs of the detention industry are a result of opposition to detention, by both detainees and those who act in solidarity with them. Those who have argued for cost-reduction rather than abolition—from Pauline Hanson to the Greens —have argued from the perspective of saving the detention industry from the problems and resistance that this industry itself generates. This frames the approach to those problems one of risk management. While there is often confusion about the practice in non-financial circles, in finance ‘risk management’ means managing possible losses that arise ‘in the course of doing business,’ so that the profit side of the ledger can, by contrast, be maximised. Risk management serves the interests of the industry and the companies involved by optimising the upside risk or potential profit margins through the minimisation of downside risk. It is risk management that has resulted in the ‘reform-salvation’ of the detention centre on Nauru, as well as the establishment of the ‘Safe Haven Enterprise Visa’ (SHEV) “Hubs” on Tasmania and in NSW. Risk management is not resistance or opposition to the detention industry. Instead, it pursues the path of ‘nicer cages’  so as to optimise the profitability of racism. In this sense, the “amplifying [of] individual pain and risk” that Sanmati mentions is by no means regarded as an unequivocal downside risk within the detention industry. As with how insurance treats death and illness, this pain gives rise not only to the political value of deterrence (the electoral value of “stop the boats” rhetoric) but also the very real monetary value for those professions associated with risk management functions. 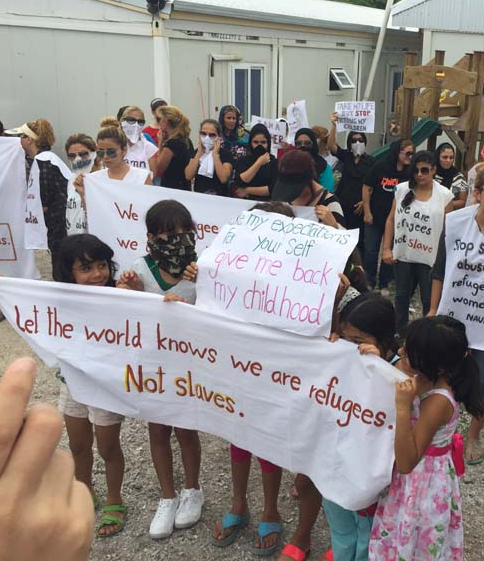 When Save the Children responded to the raid on their offices on Nauru by stating that “our priority remains working to mitigate the harmful impacts of offshore immigration detention, to the extent that the circumstances allow,” they were reaffirming their commitment to fulfilling their contract in the detention system within the framework of risk management. That role is the mitigation of downside risk but not the elimination of the practices that give rise to it, or the profits that can come from it. It is unclear whether the contract staff of Save the Children who were deported from Nauru last year (due to accusations reportedly made by Transfield, but since cleared by the Moss Review) continue to be employed by Save the Children. What is known is that STC’s contract for “Refugee Settlement Services,” from May 2014 to January 2015 was around $15.2 million, with an additional contract of $99.8 million for “Welfare and Education services to transferees at Regional Processing Countries (Nauru & Manus)” slated to end on October 31, 2015. It is also unclear to me to what extent the policy of deterrence can be sourced to the so-called “Expert Panel”—an exercise that seemed far more due to the Labor Party’s reluctance to take responsibility for its own embrace of the role of the detention system as an explicit instrument of deterrence and suffering. This role has been integral to the detention system since it began. In any case, the broader illustration of the argument that the detention industry has been under pressure to transform so as to ensure profitability is that while detention contracts involve billions of dollars, the actual profit margins have been extremely tight. Transfield’s impending rebrand as Broadspectrum is a direct result of the boycott of the Sydney Biennale and the subsequent divestment of the Belgiorno-Nettis family of its shareholdings. For the third year running, Transfield Services will be unable to pay its shareholders dividends. Its shareprice has been almost halved since it began running detention centres. Its debt-equity ratio remains so high that, unable to raise loans from regular financial agencies, it was forced to bargain an option on its own stocks in return for raising capital on the unsecured bond markets. The raiding of superannuation funds as a means, in effect, of raising cheap loans has been undermined by the divestment campaign directed toward large superannuation funds such as HESTA Divest. The chatter in the financial markets is that Transfield is being pummelled by short trades into the position of low-hanging stock primed for a take-over. How accurate this is remains to be seen. Yet with the possibility of a stock transfer to bond holders in the coming years, if it is a take-over, it will likely be by a corporate raider, less inclined to seeking a foothold than were Ferrovial. It is quite possible that AustralianSuper’s recent flag-waving  over Transfield is geared toward boosting its shareprice, and quite possibly fending off further divestment by super funds such as AustralianSuper and CBUS and naive union reps. Patriotism would be an odd argument to make though, since Transfield’s largest shareholders are Allan Gray (a S. African investment manager registered in Bermuda) and Invesco (a US investment company also registered in Bermuda). 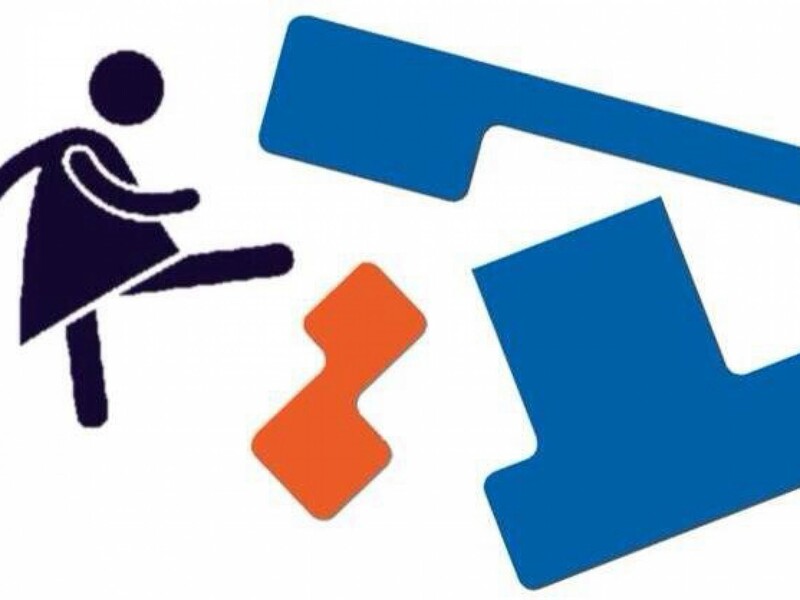 Transfield’s shareholder AGM at the end of October will be dramatic. Despite the billions to keep the detention camps operating, Transfield’s involvement in the detention industry has been a bruising if not, as yet, involved complete self-destruction. Serco has fared little better. Australia’s system of mandatory detention is poised on the edge of a series of transformations. These changes will not bring about an end to the detention of asylum seekers. Instead, they will extend and restructure what, since 1997, has been that system’s principal aim: to make racism profitable. […] the profits gleaned from those contracts verge on the edge of collapsing. Failing a major overhaul of the detention system and the opening up of new outsourcing opportunities in areas such as welfare, health and prisons, companies such as Serco and Transfield will be squeezed between diminishing revenues, compensation payouts, increasing costs and their own massive debts. […] In order for this miserable industry to remain economically viable and grow, it has to restructure and find new opportunities for exploitation. It was never a question about whether the detention industry would be transformed, but exactly how and when. The amendments were broad enough to encompass summary or minor offences, including traffic offences or, say, littering. A person’s Bridging E visa would be liable for cancellation under the provisions once they had been charged, irrespective if the charges were withdrawn or they were acquitted of the offence. For asylum seekers who arrived by boat after August 2012, having their Bridging E visa cancelled on these grounds meant immediate (and indefinite) return to immigration detention, without the ability to apply for any other visa to secure their release. After the ‘regional processing arrangements’ with Nauru and PNG were put in place, it also meant possible transfer to one of these facilities. These amendments to the Migration Regulations thus placed massive power over the lives of asylum seekers in the hands of police, and created a mechanism for constant self-monitoring and self-censorship by asylum seekers in the community. On 14 December 2013, the Migration Regulations were amended to introduce a new criteria attaching to Bridging E visas, requiring the holder to comply with a newly-introduced “code of behaviour.” While the amending instrument was not specific in its terms, the Department’s subsequent policies made it clear that the condition to abide by the ‘code of behaviour’ was to be applied to all Bridging E visas granted to “illegal maritime arrivals” – meaning, asylum seekers who had arrived by boat. you must co-operate with all reasonable requests from the department or its agents in regard to the resolution of your status, including requests to attend interviews or to provide or obtain identity and/or travel documents. The Department has not yet implemented a policy to give meaning to any of the concepts in the code of behaviour (including “lawful instructions,” “antisocial or disruptive,” “inconsiderate or disrespectful”) despite the code having been in place for almost two years. Immigration ‘Form 1443’ which contains the ‘code of behaviour’ provides the following definitions. The terms used in the code take their ordinary meanings. ‘Disruptive’ means to cause disorder or to disturb someone or something. The ‘code of behaviour’ is thus broad enough to prohibit conduct such as public protest; failure to attend an appointment with a settlement service provider (such as Red Cross or AMES); declining medical services for an injury or incurring a traffic fine. It is also broad enough to embrace the bristling discomfort and sense of ‘disruption’ experienced by average members of the Australian community faced with asylum seekers residing in their midst. The consequences for breaching the code of behaviour are disastrous. These include suspension of Medicare and income support payments, in the context where (until recently) asylum seekers who arrived by boat after August 2012 were denied permission to work. A breach of the code would also entail a breach of a condition attaching to a Bridging E visa, rendering that visa liable which would in turn expose its holder to immigration detention. For asylum seekers who arrived by boat after August 2012, that detention could continue for years on end until the Department was in a position to invite them to apply for a Temporary Protection visa. As at December 2014, around 10,000 asylum seekers had signed the ‘code of conduct.’ It is a tool carefully crafted to prolong asylum seekers’ isolation and hypervigilance, and to replicate a form of detention in the community. Both in its symbolism and practice, the code is a form of extended threat against asylum seekers and a reminder of their tenuous and subjugated status in the community at the behest of anyone who may consider their presence ‘disrespectful’ or ‘disruptive.’ It is nothing other than a form of detainment, dispersed into the hands to government agencies, doctors, ambulances, service providers, average citizens who do the detaining. Mitropoulos: As I see it, the code of conduct is a mobile mechanism for the control of migrant workers—though it involves regulations that extend well beyond any worksite. This is indeed a form of ‘broadspectrum’ control, where undocumented migrants are seen as a form of contagion. Here too, the objective is not to eliminate the movements of people or indeed risk (since without this there would be no profits), but to enact strict forms of control that emphasise a view of the border as a form of quarantine against foreign diseases. It is also remarkable that Australia is now re-modelling its refugee and asylum seeker policies as such an explicit adjunct of labour market policy, in this case as a modern form of indenture. We consider the border not to be a purely physical barrier separating nation states, but a complex continuum stretching offshore and onshore, including the overseas, maritime, physical border and domestic dimensions of the border. Treating the border as a continuum allows an integrated, layered approach to provide border management in depth— working ahead of and behind the border, as well as at the border, to manage threats and take advantage of opportunities. The suggestion that the border is not a fixed point of enclosure but, instead, a “complex continuum” that operates as a networked filter within and well beyond the cartographic lines of nation-states is an argument that critical theorists of the border have been making for some time. Indeed, the ABF’s statement mirrors most of the illustrative points in “Borders 2.0.” In that short review, contemporary border control systems were described as extraterritorial, complex arrangements of “shifting, just-in-time legal and economic boundaries” involving, among other things, the deployment of biometric technologies, urban filtration and far-flung migration officials, as well as techniques of pre-emption, excision and indebtedness—all of which are unlinked from the geographic boundaries of nation-states. In spatial terms, there are now “hubs,” the “detention network,” and the “border continuum.” An archipelago. The crucial mechanism in this ‘border continuum’ is the ‘code of conduct,’ a quasi-contractual method of behavioural control embedded within particular visa classes in such a way that, firstly, it can be ranged through all the connective moments in the supply-chains of wider economic processes; and, secondly, is backed by the force of detention and deportation, officially policed by Border Force agents and, unofficially, by those who feel entitled. Both AMES and MDA are major sponsors of Welcome to Australia , whose Director (Brad Chilcott) was also a South Australia left faction delegate at the July national conference of the ALP, and central to the ALP’s adoption a policy of supporting turning back boats at sea. The emerging system of using asylum seekers as indentured, highly precarious labour – primarily in remote areas and backed up by the threat of detention – is a modified version of “Tasmania Opportunity,” a policy supported by the Greens and Julian Burnside, promoted by GetUp’s LightTheDark sponsors (including contractors in the detention industry such as Connect), and whose mechanism (the SHEV) was a result of a deal between the current Social Security Minister (Scott Morrison) and Clive Palmer (mining industry operator and politician). Follow the money. Mitropoulos, “Archipelago of Risk: Uncertainty, Borders and Migration Detention Systems,” New Formations 84 (2015): 163–83. Mitropoulos, Verma and Kiem, “Are Divestment Campaigns Calls For Nicer Cages, Ethical Carnage And Cleaner Coal?,” New Matilda (September 10, 2015). Xborder, “With Intent: Death and Suffering as Policy,” (2000). Mitropoulos, “From Precariousness to Risk Management and Beyond,” EIPCP: Transversal, 2011. Pezzullo, “Sovereignty in an Age of Global Interdependency: The Role of Borders” (Australian Strategic Policy Institute, 2014). ABF, “Who We Are.” Ibid. “Internments: CPT and Other Camps” (Conflitti globali: Sixth Framework Research Programme of DG Research (European Commission), February 19, 2007). Mitropoulos, “Autonomy, Recognition, Movement” (2006). Mitropoulos, “Borders 2.0: Future, Tense,” Mute 2, no. 10 (August 2008). This is also reminiscent of Australia’s colonial mission system, where the emphasis was on instruction and training under Australia’s assimilation policies viewed as benevolent. See Mitchell, In Good Faith? Governing Governing Indigenous Australia Through God, Charity and Empire, 1825-1855. ← So you say you want to “stop the boats”? Qui Bono who benefits, who profits ? – Cicero in another Empire other daze.